35 mm stainless steel case, pink sapphire crown, diamond bezel, sapphire crystal, silver dial, quartz movement, stainless steel bracelet with single twirl version. Water resistant to 100 ft.
35 mm stainless steel case, pink sapphire crown, sapphire crystal, silver dial, quartz movement, stainless steel bracelet with single twirl version. Water resistant to 100 ft.
35 mm stainless steel case, pink sapphire crown, diamond bezel, sapphire crystal, silver dial, quartz movement, stainless steel bracelet. 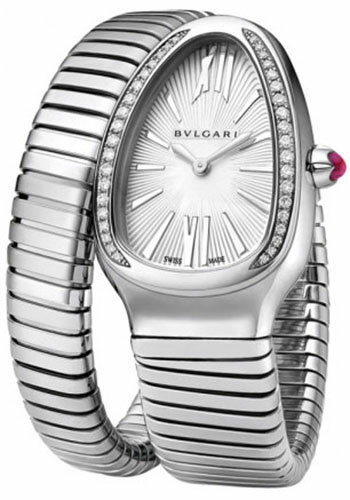 Water resistant to 100 ft.
35 mm stainless steel case, pink rubellite crown, sapphire crystal, silver dial, quartz movement, stainless steel bracelet with single twirl version, size L. Water resistant to 100 ft.
35 mm stainless steel case, pink sapphire crown, diamond bezel, sapphire crystal, silver dial, quartz movement, stainless steel bracelet with double twirl version. Water resistant to 100 ft.
35 mm stainless steel case, pink sapphire crown, sapphire crystal, silver dial, quartz movement, stainless steel bracelet with double twirl version. Water resistant to 100 ft.
35 mm stainless steel case, pink sapphire crown, diamond bezel, sapphire crystal, black dial with steel strips segmented with pave set with diamonds, quartz movement, stainless steel bracelet. Water resistant to 100 ft.
35 mm stainless steel case, pink sapphire crown, diamond bezel, sapphire crystal, black dial with steel strips segmented with pave set with diamonds, quartz movement, stainless steel bracelet with double twirl version. Water resistant to 100 ft.